Like all pop culture franchises, the Muppets have had their ups and downs. We middle-aged fans love to remember The Muppet Show, The Muppet Movie, and The Muppet Christmas Carol, while preferring to forget The Muppet Babies and Muppets from Space. Creative energy is hard to sustain. 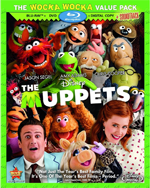 The Muppets (2011) tackles the notion of bringing back a beloved franchise. It’s about being a fan of said franchise and how it all fits into a changing world. If that all seems too heavy for a kids’ movie, it’s also about the Muppets being their old silly selves. In this movie, the ultimate Muppets fan is Walter (Peter Linz), a Muppet who was inexplicably born into a human family. (Perhaps the true ultimate fan is Jason Segel, who co-wrote the screenplay and stars as Walter’s brother Gary.) In any case, Walter is meant to represent the fans, and is bitterly disappointed to find that the Muppets’ old magic has dissipated. In the world of The Muppets, the gang hasn’t performed together since their eponymous show ceased production 30 years ago. Kermit the Frog is a one-percenter living in a gated estate. Fozzie Bear is performing in a Muppet tribute band in Reno (the cringe-inducing Moopets). The beloved Muppet theater is run-down and decrepit. Why not just sell the old building to evil oil magnate Tex Richman (Chris Cooper)? Can Walter get Kermit to get the group back together? Can they raise enough money to save their theater? Will Tex Richman have a change of heart? Will Animal unleash his inner drummer? Is it possible to do a barbershop quartet version of Smells Like Teen Spirit? And what is the answer to the question “Man or Muppet”? Not everyone has been thrilled with the movie’s version of post-celebrity Muppets. Some of the old puppeteers, most notably Frank Oz (Miss Piggy, Fozzie, Animal and many other characters), declined to participate. This leads to more serious questions: Can’t they make a funny, entertaining Muppet movie without examining the Muppets’ place in the current cultural landscape? Do we really need to see Kermit and Miss Piggy wistfully discussing their broken romance? Are these characters Muppets or Moopets? As a 40-something fan who grew up with Sesame Street, The Muppet Show and The Muppet Movie, I felt like I was watching my old familiar friends. Kermit still gulps nervously, Miss Piggy throws her diva weight around, Fozzie tells painfully bad jokes. Jack Black, under extreme duress, makes the perfect celebrity guest for the revived show. The silliness could have been turned up a couple more notches. Some of the jokes fell flat (Richman says “maniacal laugh,” because he doesn’t have a good laugh, um, OK.) And poor Walter, the Muppet stuck in the human’s world, is a little too bland next to the other crazy creatures. All in all, I spent more time smiling and laughing than I did groaning. We can’t go back to the days of The Muppet Movie, the world has moved on, but The Muppets make a solid addition to the franchise. The “Wocka Wocka Value Pack” has three discs: a Blu-ray, a DVD and a digital copy of the movie. The pack also includes a code for downloading the movie’s soundtrack. Director James Bobin and co-writers Jason Segel and Nicholas Stoller provide a cheery and chatty commentary track. There are occasional nuggets about the process of writing the script and the logistics of making a movie with puppets, but they spend most of the time cracking each other up. More fun to watch are seven theatrical trailers that parody other movie trailers ( Planet of the Apes, The Fast and the Furious, there’s even a parody of one of the parody trailers). Other bonus features exist in a world where there are no puppeteers, only Muppets. A blooper reel (8:35) has actors and Muppets missing their lines and clowning around. A Little Screen Test on the Way to the Read-Through (3:20) has the human actors and Muppets (as themselves) heading to the first read-through of the script. Scratching the Surface: A Hasty Examination of the Making of The Muppets (16 minutes) looks behind the scenes with actors and the Muppets as themselves. There is also a longer version of Tex Richman’s rap, which explains his particular hatred of the Muppets. Finally, there are eight deleted or extended scenes (10 minutes in all), including several celebrity cameos that were cut, and a bit that explains Walter’s special talent. Exclusive to the Blu-ray is an “intermission” feature. Press pause and a red curtain fills the screen. Then various Muppets clown around until you’re ready to go back to the movie. It’s fun stuff, but you’re out of luck if you want to examine a freeze-frame. The only bonus feature on the DVD is the blooper reel. The movie is presented in its original 1.78:1 aspect ratio. The sound is DTS-HD 7.1. Both the picture and sound on the Blu-ray are excellent. Watch the movie. Press pause once or twice to see what the “intermission” feature is all about. Afterwards, check out the blooper reel, the trailers, and the behind-the-scenes feature.